When I have java or php code, I cannot collapse a class, there is no + sign in the gutter. In python however, this does work. Using IntelliJ 134.1007. 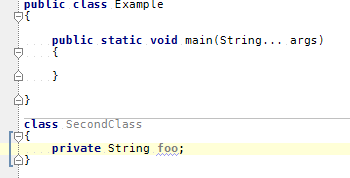 IntelliJ IDEA only adds folding points at the class level if the file contains more than one class (and each class has some content). For example, here is a file with two classes. Notice it has folding regions for the classes. In the long run, this makes sense since a collapsed class (when there is only one class in the file) does not make much sense. In fact it is a small pet peeve of mine that in XML files the root tag is collapsed when you do a collapse all. To me that makes little sense since when would I want to look at just <root ...> in the editor? I care about the nested elements.